Yesterday the Community Security Trust (CST) published its report into antisemitic incidents in 2018. It shows that for the third year in a row the trust recorded a new record high of 1,652 antisemitic incidents in the UK. This is a troubling indication that there is an ongoing increase in these hate crimes. 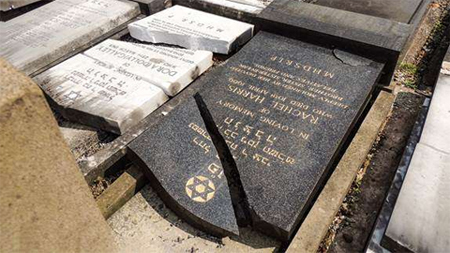 Broken Jewish headstones in Manchester, June 2018. The 1,652 antisemitic incidents CST recorded revealed a 16 percent rise above the 1,420 incidents they recorded in 2017. And for the first time in any calendar year, there were more than 100 incidents recorded in all 12 months. 148 of those antisemitic incidents recorded in 2018 were related to arguments over allegations of antisemitism within the Labour Party. 80 of those incidents occurred in 3 months during which allegations of antisemitism in the Labour Party attracted significant media attention. In particular, the row over the party’s watering-down of the internationally accepted definition of antisemitism drew a lot of attention in the summer; with Margaret Hodge MP accusing Jeremy Corbyn of being an antisemite. The CST’s report prompted Home Secretary, Sajid Javid, to state that all acts of antisemitism are “utterly despicable and have no place in society”. Ominously, it seems that this deep-seated hatred is beyond the influence of any government, as it refuses to decrease despite efforts to eliminate it.